United States goalkeeper Hope Solo walks on the sidelines before a CONCACAF soccer match against Haiti, at RFK Stadium, Monday, Oct. 20, 2014, in Washington. 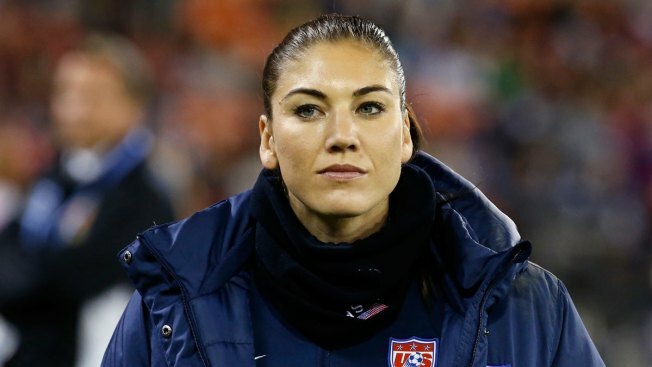 U.S. women's soccer star Hope Solo said in an interview with Sports Illustrated she might not go to Brazil for the Summer Olympics because of the Zika virus, the magazine reported Tuesday. Solo and the women's national team will play Costa Rica on Feb. 10, in their first match of the 2016 CONCACAF Olympic Qualifying Championship in Frisco, Texas. Solo told SI she wouldn't go to Rio "if I had to make the choice today." She's the first high-profile athlete to comment on Zika and the 2016 Summer Olympic Games in Brazil. The outbreak in Brazil was first reported in 2015, and later linked to a startling increase in infants born with microcephaly, a birth defect that results in babies born with abnormally small heads, according to the U.S. Centers for Disease Control and Prevention. The Zika virus is spread to people by mosquito bites and causes fever, rashes, joint pain and conjunctivitis. There are 26 countries and territories in the Americas listed as zones with active Zika virus transmission by the CDC. Brazil, Costa Rica and Mexico are all on the list; Puerto Rico is the only U.S. territory where Zika is actively being transmitted. "The safety of our athletes and staff is always the highest priority, and we are taking all necessary precautions in regard to the Zika virus," the U.S. Soccer Federation said in a statement.